DURHAM, N.H. - The University of New Hampshire women's ice hockey team held a 2-0 lead entering the third period of play. After a five-goal third period, the 'Cats remained on top by a score of 5-2, as they defeated the University of Maine Black Bears on Saturday afternoon. The Wildcats were led by senior Devan Taylor (North Billerica, Mass.) and junior Meghara McManus (Milton, Mass.) who each tallied a team-high three points. Junior forward Taylor Wenczkowki (Rochester, N.H.) also aided the cause with two third-period goals, including the game-winner. Senior captain Kyra Smith (Littleton, Colo.) stopped 31 of Maine's 33 attempts in the victory, which now puts her season record at 11-7-2. The two teams came into the weekend tied for seventh place in the Hockey East standings with 17 points. The Wildcats, with the win, leapfrog Maine and UConn to sit in sixth place in the standings with 19 points. The two teams will meet again on Sunday afternoon, February 3, at 2 P.M. with huge conference points at stake. The Wildcats and Black Bears are currently even in their season series, 1-1-0. - At 1:21 of the first period, junior Carlee Turner (Scottsdale, Ariz.) took a wide shot that ricocheted off the boards to junior Meghara McManus (Milton, Mass.) who sent a one timer into the back of the net. - Another quick goal, 57 seconds into the second period, senior Devan Taylor (North Billerica, Mass.) scored from the crease off a rebound from a shot by McManus. - The third period began the same as the first two, with a quick goal coming this time from Maine, 41 seconds into the period as the power play expired. Maine tucked a goal from out in front of the net through the traffic in the crease, making the score 2-1. - At 8:29 into the third period, junior Taylor Wenczkowski (Rochester, N.H.) got caught in the corner scrum, picked it out of the scrum and skated to the center, sniping one past Jackson bringing the score to 3-1. - 13 minutes into the third period, Wenczkowski deflected a shot from in between the face off circles and sniped one bar down, bringing the score to 4-1. - Maine answered just seconds later on a two-on-one rush with a long cross ice pass, making the score 4-2. - At. 17:50 of the third period, Devan Taylor scored an empty net goal, bringing the score to 5-2. - Four Wildcats tallied multiple points in the contest. - Wenczkowsi and Taylor both tallied two goals, for Wenczkowski's third multi-goal game of the season, and the fifth of her career. Devan Taylor tied her career high and set a new season high with three points in the contest. 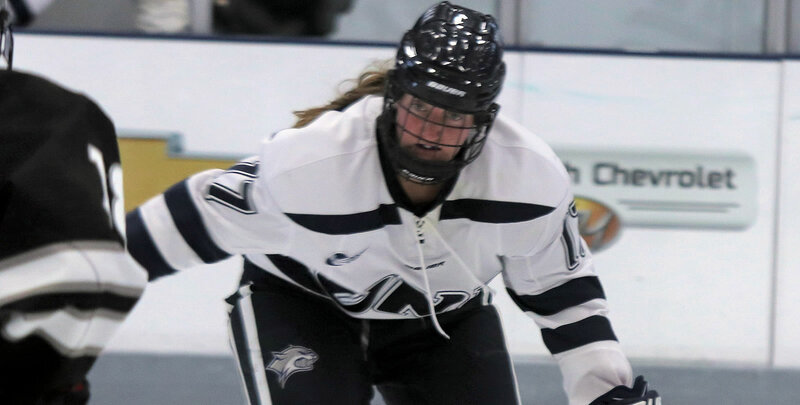 - McManus and Rheault both had multi-assist games; Rheault tallied the second multi-assist game of her career, and the second this year, while McManus set a new season high with three points (1g, 2a). - Devan Taylor and Paige Rynne extended their point streaks to four games (Taylor, 3g, 3a, 6p | Rynne 1g, 3a, 4p). - UNH's penalty kill stopped all five Maine power play opportunities in the game, with one of Maine's goals coming just one second after the penalty expired.